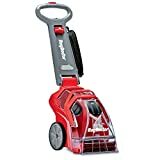 This Hoover Power Scrub Deluxe Carpet Washer is manufactured to clean various carpeted and fabric surfaces all around your home. This Carpet Basics Power Scrub Deluxe can also help you to extend the life of your carpet. The device comes with spill-free tanks, It works on SpinScrub Technology and uses heated air for quick drying, you will get a powerful, efficient clean. 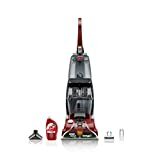 Here is a detailed Hoover Power Scrub Deluxe Carpet Washer Review, so that you can make a wise decision. The tank is very easy to fill, clean and empty, give you mess-free experience. The device comes with 4 Easy To Access Handles that makes it highly portable. It has 4 different choices of handles. Its Wash/Rinse Selector washes your carpets with soap & water and then just rinse your carpets with normal water to remove soap residue. The device also comes with automatic detergent mixing system gives the correct ratio of detergent and water to give optimal cleaning results. The appliance has fast dry time with forced heated air. The device also comes with 8 ready to use Hose and Upholstery Tool to which help to clean deep clean stairs and hard to reach areas. Rinse/Wash Selector – The appliance rinse selector feature makes it very easy to rinse the carpets ie. you can even wash the carpet without detergent. Lightweight – This device weight is about 18 lbs (without water), which is very light as compared to other similar product. Best Handtools – All the tool which comes with this appliances are very useful. Everything can be cleaned very efficiently: from crevices, sofas and other upholstery, to stairs and nooks, to car and upholstery mats. Good Design – The machine has an attractive design and all its parts fit well. Smaller capacity – one of its disadvantages is that it tank capacity is very small. Not commercial quality – The product is only designed for household work, not for commercial purpose. Hard to see when clean water has been used up – Its water tank is translucent but dark, so it’s really difficult to clearly tell when the water has been used up and when you should refill the tank. No multiple brush speeds – The machine operates on only 1 speed. The Device comes with all the necessary tools for cleaning upholstery, not just the carpet. But it does not clean upholstery very efficiently. The device is also not very efficient for cleaning thick carpets. Its power cord is an average length. When the screws in the brush rotation turbine get rust the brushes sometimes stop rotating. Then it can not clean the carpet effectively. But it can clean surface stains. Because of its design, the screws get wet because they are not protected by any cover and not made up of stainless steel. The Hoover Power Scrub Deluxe Carpet Washer is also a smaller-sized device, but it is very effective carpet cleaner. The product comes with a two-tank system which separates out the clean water from the dirty water. If you have a lot of carpets you might be frustrate to refilling and emptying its tank. But if you don’t, this is an amazing device for an effective carpet washer. Watch this video to understand more about the product. This carpet cleaning device does a decent and perfect work for almost all type of carpets and tough stains. It uses multiple passes of water and warm air to remove stains and also all the detergent residue. the most important of the device is its ease of use and affordable price. After reading our Hoover Power Scrub Deluxe Carpet Washer Review what do you think about this product? whether it is important for you or not. Share your reviews in our comment section below. If you need a machine that gets soiled carpets really clean and is very easy to use, the Hoover Carpet Power Scrub Deluxe Carpet Washer will perfect option for that.